The new Research and development facility will play an important role in development of Artificial Intelligence and Machine learning in OnePlus products and services in future. 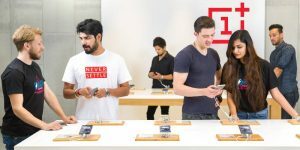 OnePlus is Betting big on the Indian smartphone market, Chinese mobile phone manufacturer OnePlus recently announced that it was working to grow its recently opened Hyderabad facility into its world biggest R&D centre in next three years. With Chinese premium smartphone player OnePlus massive growth in India, the smartphone manufacturer disclosed its plans to set up an R&D facility in the city. According to a statement from the company, the facility will not only play a critical role in development of Artificial Intelligence and Machine learning in OnePlus products, but will also drive innovations that are centric and relevant to the company’s Indian community. OnePlus says that it has analyzed and examined all the several critical factors before finalizing on Hyderabad for the R&D centre, with the city being one of the home of most start-up companies in the country, especially in the space of emerging technologies and innovations. The company said it would also leverage the ingenious talent from the city which is one of the biggest IT hubs in the nation. The R&D facility will play a crucial role as OnePlus charts its roadmap towards adopting the Indian market as its home ground. OnePlus said in the statement that it is committed to achieving long-term growth in India, and with the commencement of operations at the new R&D centre, OnePlus seeks to integrate and delve deeper into the ‘Make in India’ strategy. The centre will also contribute to nurturing and giving opportunities to fresh talent as the Company initiates the campus hiring program at number of universities including the IIT Delhi and IIT Mumbai this year. OnePlus is witnessing growing user base in Hyderabad, the company is also in process of expanding operations of its offline presence in the Andhra pradesh and telangana State. It will soon launch an OnePlus Experience Store in the city as well. The brand currently has an Exclusive Service Centre in the city and is also present in retail outlets through its associated partners like Croma and Reliance Digital. India is not only one of the biggest markets for OnePlus with massive growth and opportunities. Currently the company is looking for growth drivers to make the country a centre for product innovation. It has already upgraded to local production of PCBs as well as other smartphone components and will continue to look at further plans as the government announces the next wave of localization.